It’s many RVer’s dream – I mean everybody from luxury RVers who drive massive custom motorhomes and don’t worry about gas to people building their own DIY teardrop trailers in their garages for weekend camping – it’s a dream of all of us to be able to drive without fueling up or even charging up (for Electric Vehicles). We’re mostly looking at solar panels to provide us with endless power on the road. How viable is it? It gets closer to reality every day, as battery technology is now one of the most important, and therefore focused-on, areas of research and development of all consumer and industry products. 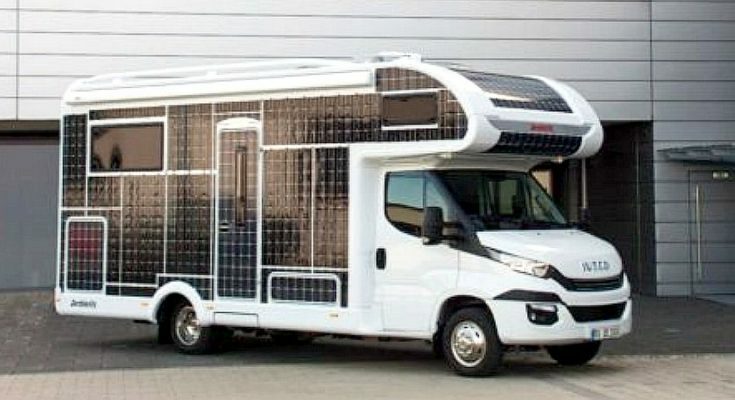 So when you see an RV covered in solar panels as its main source of power, you might get a bit excited, because it means its getting closer for all of us to have one. This RV motorhome is by Dethleffs, it’s called their e.home – not only an RV but in concept also a tiny home competitor. How many solar panels are on there? 334 square feet of them! This gives the motorhome a 154km/103 mile range, which is a good range for the current stage of battery powered cars. The reason is weight – RVs have and are loaded with greater weight than electric cars, and this requires a lot more battery power to push. According to the company though, it can b pushed further: the maximum range of the vehicle is actually 280 kms (174 miles) on the European scale (The EPA would rate it around 225 kms or 140 miles, reportedly). The battery does have a long life though. It’s good for around 1500 charges, which means about 250,000 kms / 155,000 miles before you need to replace the battery in this electric motorhome. What range do you need before you would consider an electric vehicle for an RV motorhome? To see an electric RV that is now on the market, click here.